Desert Ice Castle offers public skating sessions open to the general public with convenient times throughout the week. All sessions are open to the public. For your safety and enjoyment each public skating sessions is supervised by an “on-ice” staff member. Skaters under 18, must have waiver filled out and signed by parent/guardian. 1. SKATE AT YOUR OWN RISK! 3. In the event of an injury, notify a skate guard or rink personnel IMMEDIATELY. 4. Skate counter clockwise unless directed otherwise. 5. NO DOUBLE JUMPS OR SPINS. Figure skaters practicing jumps, spins, turns, must do so in the center of the ice. Outside lanes are coned off and are for general skating. 6. No more than 2 people may skate together. 7. Skating in a manner that endangers or interferes with other skaters’ safety is prohibited. 8. Tag and other games are prohibited. 9. Roughness, excessive speeding or weaving through skaters is prohibited. 10. Skaters are NOT to carry children or secondary items such as cameras, handbags, etc. while skating. 11. For skaters protection, NO headphones allowed. 12. Hockey sticks and pucks are not allowed during public skate. 13. Throwing snowballs or any object is prohibited. 14. No eating or drinking on the ice surface. 15. Patrons must not sit on, lean over, or leave articles on the glass or dasher boards. 16. Report any rule violation to a skate guard or rink personnel. 17. Please leave ice promptly when announcement is made for ice resurfacing at the end of each session. Looking for that special event that can be played by all? We have the game for you and your group! A maximum of 15 players to each side using the full length of the ice surface plus nets. 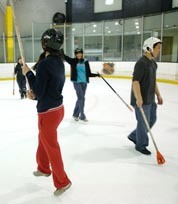 Equipment which includes, helmets, broom ball sticks, and ball are provided and included in the price by Desert Ice Castle. Cost is $350.00 an hour, with 30 people that equals less then $12.00 per person. Please enquire for more details!